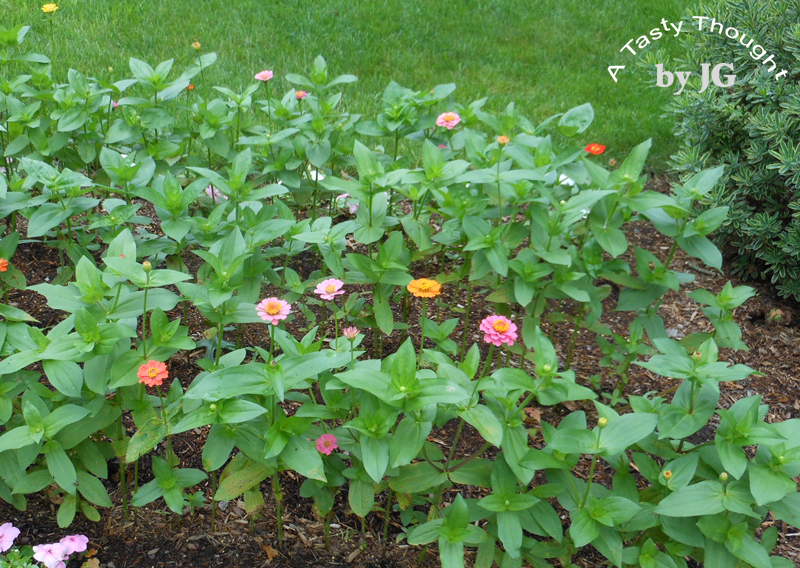 The Zinnias are really enjoying the heat!!! 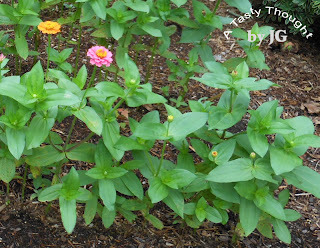 Those little seeds that were planted over Memorial Day weekend, germinated and now the Zinnia plants are just on the move. About 3 weeks ago, they did need to be thinned out. At that time the petite plants were large enough to take a few "clumps" and transplant them to other areas in the rows that needed to be filled. (Not every seed germinated. Some were also washed away.) 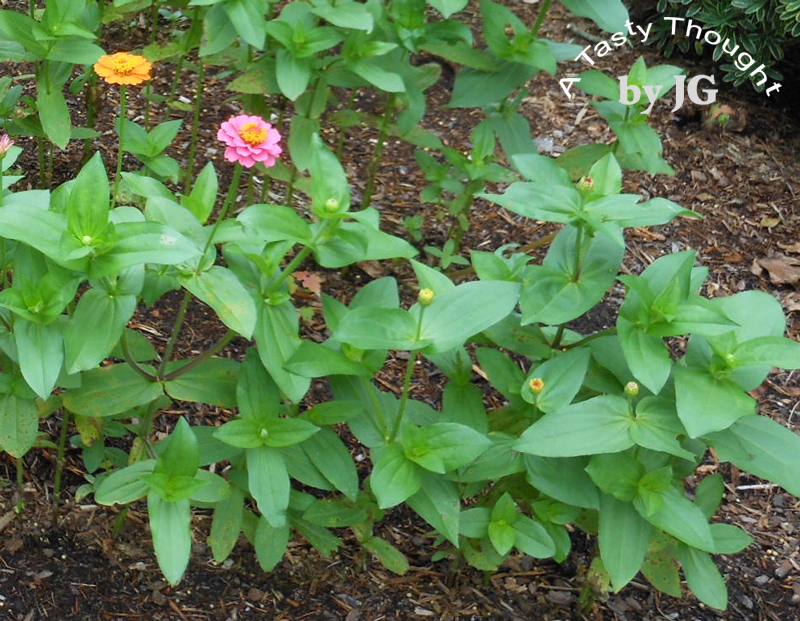 Now, the bright abundant colorful flowers look great! Each plant is "branching out" and many buds are visible, too. 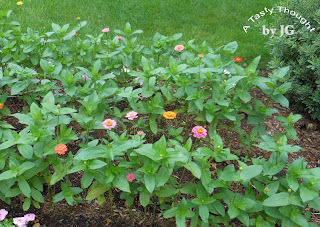 So, I may be spending as little time as possible outdoors during our 4th heat wave this year, but those Zinnias are sure lookin' good! Today is day 6 of this heat wave. This is extreme for my corner of New England. Yes, I remember our winter, but now, just waiting it out for Sunday's cool low 80°'s! Definitely having plenty of H2O! Seeing blue! Oh, the local blueberries, that is! Yesterday afternoon, we took the annual drive out to Calabrese Farms in Southwick, MA to purchase the ripe, yummy, dark blue fruit at their farm stand. Every year I purchase the year's supply from them and prep the the fresh berries for our large freezer. As with strawberries gone are the days when "pick your own" is my preferred method of getting my supply to freeze for pancakes and other tasty faves. Also, to make make jam. Definitely Freezer Jam! With our 90° + weather, it's the only jam to make. Later yesterday afternoon the Ziploc Freezer Bags each containing 2 cups of the sweet fruit found their place in our freezer. There is a quart of these delicious berries remaining in our fridge - for cereal, for fruit salads and for snacking! Yum! This afternoon my agenda was 2 batches of Blueberry Freezer Jam. The directions are found inside the CERTO box. CERTO (Liquid Fruit Pectin), Lemon Juice, Sugar and Blueberries are needed along with the freezer containers. My containers of choice are Ziploc 1 cup Freezer Containers. 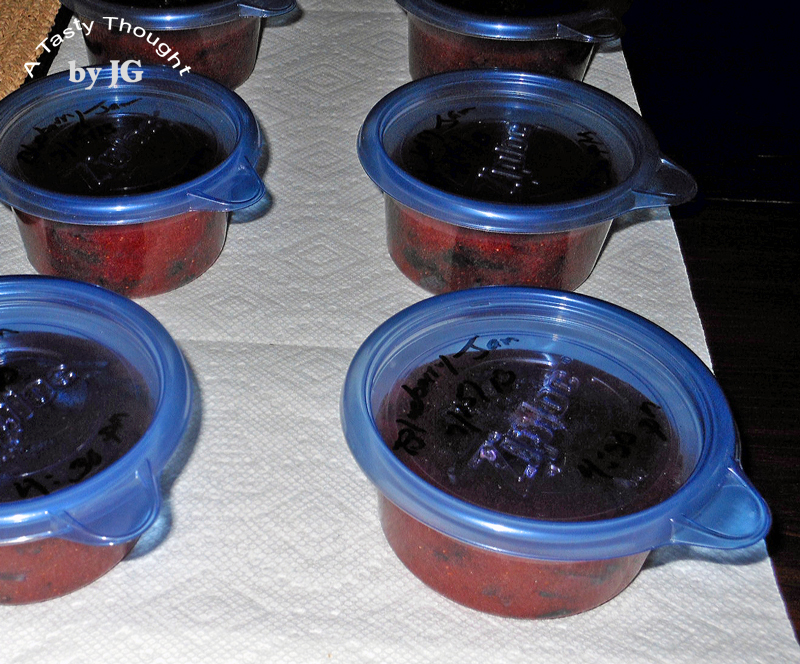 ***I always have 1 extra container ready to use when pouring the liquid mixture into the cups. Freezer Jam is very easy to prepare and tastes totally great! Do you prepare this in the summer when the fruit is available? After days of intense heat and high humidity... and rain stopping in, I have not used my oven in a couple of weeks. The A/C has felt so good. We've been enjoying grilled fish at dinner time and I've been using the stove top. Definitely summertime in New England! Suddenly, Yummy Blueberry Muffins came to mind! Well, there were no bags of tasty frozen blueberries to be found in our large freezer. However, 3 combo packages of Blueberries/ Red Raspberries were located. I remember purchasing a large bag at Costco's during the winter and dividing the contents into Ziploc Qt. sized Freezer Bags. 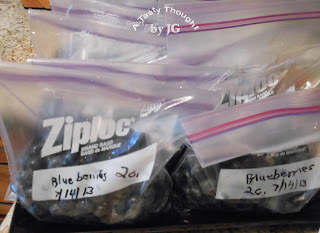 My supply of our local frozen blueberries usually runs out before the next year's supply is cleaned/ packaged and placed in my freezer. It's now that time of year! So, 1 package of the mixed berried was defrosted. Amazing to me how much fluid needs to be drained from the purchased bags of defrosted berries before using them. After locating my Yummy Blueberry Muffin recipe, 22 Blueberry/Raspberry Muffins were placed in my preheated oven. 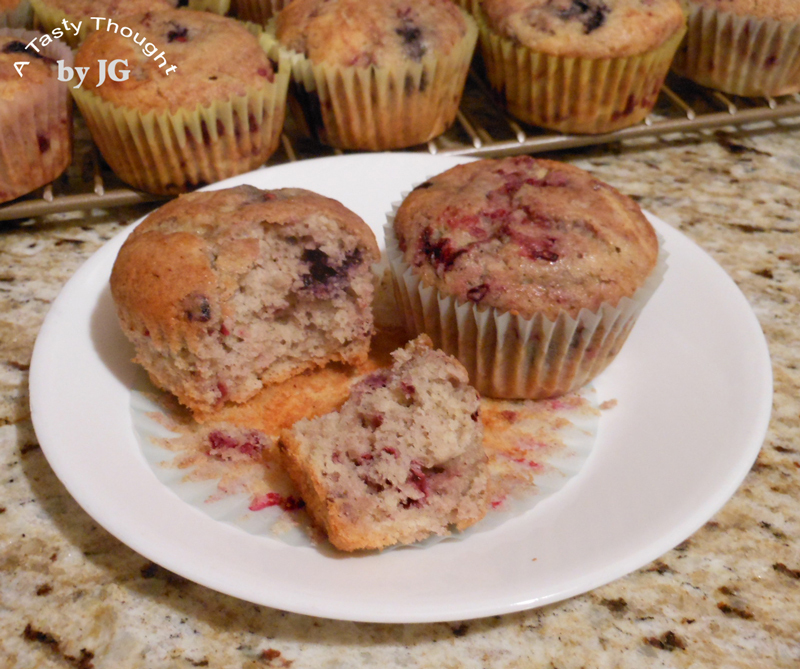 The batter was swirls of pink containing berries, so I was unsure about the resulting muffins. The result? Oh, they definitely have a raspberry taste! 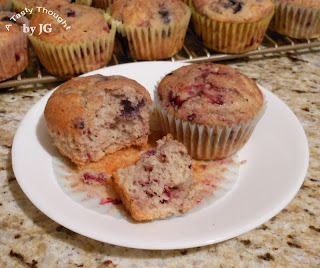 I will be using the other 2 packages in my freezer to bake these muffins again. :) Yum! Add Baking Powder, Salt, Cinnamon, Nutmeg and 1/2 of Flour. Beat. Gently add in Blueberries & Raspberries. Stir in with Spatula or large Spoon. These are delicious muffins! My Plan B worked well! Adding only Raspberries to the batter would also be very tasty. You will enjoy these! Day 3 = Heat Wave! Definitely drink plenty of water! Our new outdoor grill will be used today! Woohoo! With a little Cinnamon & a little Nutmeg! Oohh, what a great tasting pancake! There was a quart of fresh Strawberries in our fridge and there was a pkg. 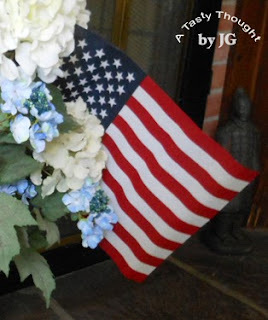 of "JIFFY" corn muffin mix in the pantry. Saturday AM a quick & easy breakfast was needed. With our current weather of heat and also storms mixed in, our lawn grows quickly. My DH's plan was to mow the front/ sides and perhaps squeeze in mowing the back. It all depended on what surprise Mother Nature had for us. Usually a mashed Banana is added to the batter. However, Saturday AM the fresh Strawberries suddenly came to mind. 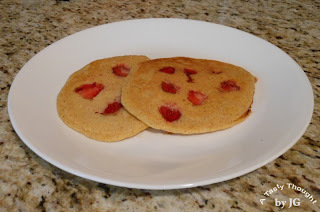 Adding sliced fresh Strawberries to the batter (on the griddle) makes for very yummy pancakes. 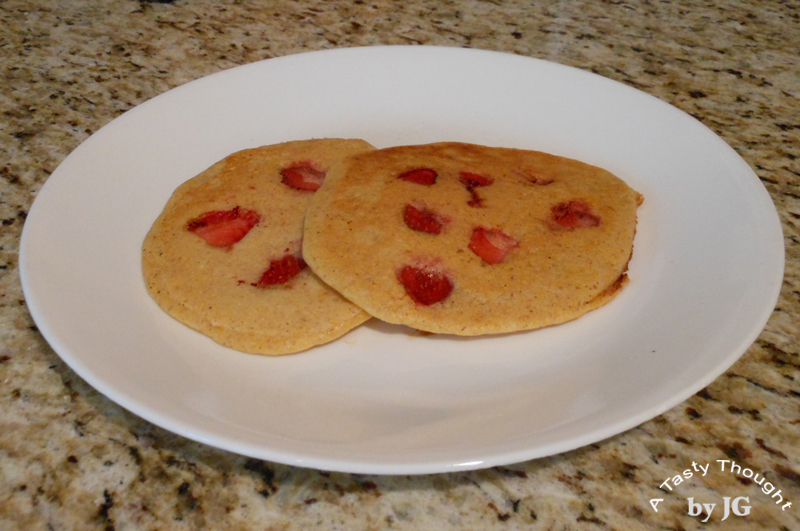 Warmed Strawberry slices combined with Cornmeal is so good!